The final instalment? Hmm, maybe. For now, anyway. Depends on demand and right now there doesn't appear to be very much of it. In 2004, 'Around The Sun' was released. This was R.E.M. at their absolute nadir. Even the band decried it as a poor record some years later. Peter Buck called it "unlistenable... It sounds like what it is - a bunch of people that are so bored with the material, they can't stand it anymore." This, however, did not mean R.E.M. were no longer an exciting live band. On the contrary, it was during the subsequent tour in 2005 that the band's first official live album was recorded. Perhaps another hint at their lack of creativity around this time was that record's title: 'Live'. Wow. In the summer of 2005, R.E.M. were one of the headliners at the 20th anniversary of Germany's biggest rock festival Rock am Ring in Nürburg. The set is very different from that eventually released on 'Live' (which was recorded in Dublin some four months earlier). The Outsiders featured on 'Around The Sun' and is pretty typical of the rest of the album in that it's a mid-tempo plodder that is largely forgettable. It did, however, feature a turn from rapper Q-Tip (of A Tribe Called Quest fame). This was not the first time R.E.M. had roped in assistance from the hip hop community - KRS-One appeared on the execrable Radio Song on 'Out Of Time'. Is The Outsiders a better song than that? Hmm, maybe, and this live take certainly beats the crap out of the studio version. Out go those awfully dull keyboards and, in their place, a lovely swampy guitar sound. Stipe does the rap himself. Animal was one of two new songs that appeared on a greatest hits album called 'In Time: The Best of R.E.M. 1988-2003' the autumn before 'Around The Sun' came out. It's a rather gnarly minor-key rocker that I actually rather like. Considering it came between the double-travesty of 'Reveal' and 'Around The Sun' it stands out as one of their best songs of the era. Live it sounds even rockier, shorn of some of the electronic pizzazz that graced the studio version. It's worth mentioning that while 'Live' was R.E.M. 's first official live album, 1996's 'New Adventures in Hi-Fi', their last record with Bill Berry, was largely recorded live during soundchecks and concerts. I think 'New Adventures' was the first R.E.M. record to suffer from excess length, but that aside, I've always really liked it. Michael Stipe rates it as his favourite R.E.M. album, and Mike Mills thinks it's their third best, with only 'Murmur' and 'Automatic For The People' above it. My favourite track from 'New Adventures In Hi-Fi' was, and still is, Leave. It's a bit of an epic and the longest song the band ever recorded. For whatever reason, it was hardly ever played live. The album version consists of an instrumental version played during a soundcheck with Stipe's vocal added later in the studio. Stipe sang snippets of the song acapella a few times during the 'Up' tour in 1999, but it wasn't until 2005 that Leave finally made it into the band's live set, aired about 18 times in all. Then it was never played again. It didn't make it onto 'Live' so unless you have a bootleg of one of those shows, you'll never have heard it. Until now! Here they are performing Leave in Germany. A cracking rendition only slightly marred in parts by Bill Rieflin's over-enthusiastic drumming. The Outsiders [live at Rock am Ring 2005] - R.E.M. Animal [live at Rock am Ring 2005] - R.E.M. 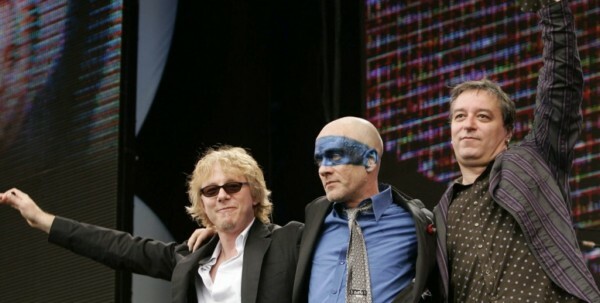 Leave [live at Rock am Ring 2005] - R.E.M. And on that note, I'm going to Leave it at that (arf!). I haven't decided if I'm going to continue this series any further, though it's unlikely to be honest. If I do, it'll be a while. Don't hold your breath. For me 'New Adventures in Hi-Fi' is most definitely the hig water mark of REM. I just wish I could find a copy on vinyl without having to pay an arm and a leg for it. Thanks for all the posts in this series!